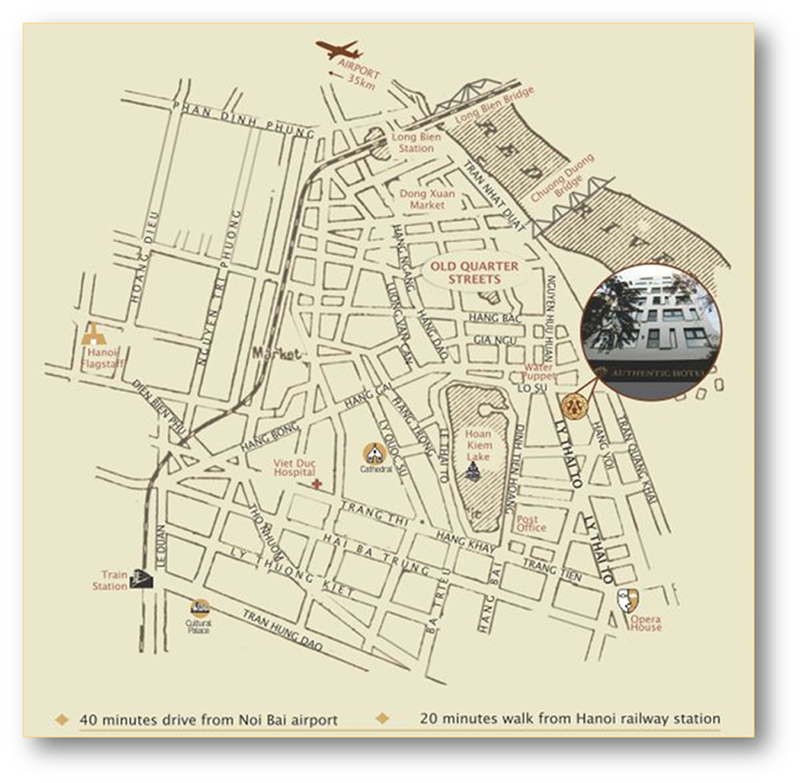 Authentic Hanoi Hotel is conveniently located at the edge of Hanoi's Old Quarter. This exclusive residence, the newest luxury 4 stars hotel in Vietnam's capital, is unlike any other property in this dynamic city. Authentic Hanoi Hotel is conveniently located at the edge of Hanoi's Old Quarter. 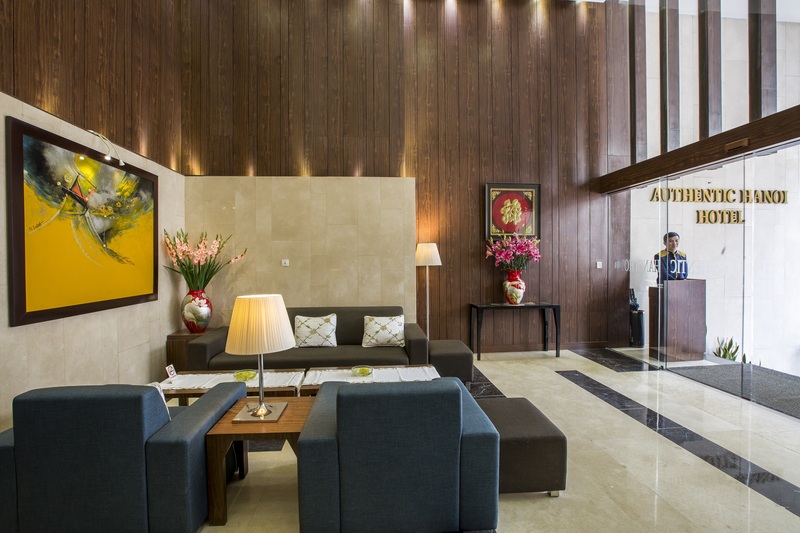 This exclusive residence, the newest luxury 4 stars hotel in the heart of Hanoi. Located in the heart of Hanoi Old Quarter, Authentic Hanoi Hotel is the perfect place for all tourists and businessmen whose prefer to stay in a quiet and comfort location setting surrounded by greenery, close to the main attractions, but away from the noisy old quarter. From here, it is only two minutes walk to the Lake, shopping area in the 36 ancient streets and just short distance to Ho Chi Minh Complex, Temple of Literature, Hanoi Opera House, other attractions and restaurants. Authentic Hanoi Hotel has 71 brand-new modern rooms. These rooms were designed and equipped to offer you everything you might need: Luxury Décor, Comfortable Stay and Elegant Services. Authentic Hanoi Hotel specializes in meeting and event services. We have two luxury meetings rooms which are decorated in luxurious style. Song Hong meeting room is located on 11th floor. The capacity is up to 70 guests. Song Hong Meeting Room has the good view to Red River. The smaller meeting room ( up to 20 guests) is located in 1st floor. All the rooms are qualified for the international standard. Authentic Hanoi Hotel has a cosy restaurant that serves excellent dishes of Vietnamese cuisine, with fresh products of local Hanoi. The restaurant will be serving from 06.30 until 22.00 everyday including weekend. The excellent central location of Authentic Hanoi Hotel sets guests close to all that downtown has to offer with five minute walk to Hoan Kiem Lake, Old Quarters and numerous attractions. The excellent central location of Authentic Hanoi Hotel sets guests close to all that downtown has to offer with three minute walk to Hoan Kiem Lake, Old Quarters Street, Hoa Lo Prison and numerous attractions. Hanois most visited temple stands on a delighful little island in the northern part of Hoan Kiem Lake. The nearby elegant scarlet bridge, The Huc (Rising Sun ) Bridge constructed in classical Vietnamese style and lined with flags connects the island to the lake shore. The adjac ent Martyrs Monument was erected as a memorial to those who died fighting for Vietnam's independence. St. Joseph's Cathedral is an exquisite church of the late 19th-century Gothic Revival (Neo-Gothic) style ad serves as the calthedral of the Roman Caltholic Archdiocese of Hanoi. Its construction began in 1886 and its architectural style reportedly resembled Notre Dame de Paris. The church was one of the first structures built by the French colonial authority in Indochina when it was opended in December 1886. St. Joseph's Cathedral currently features masses at weekends and druing key holidays and occasions.